Iron Ridge was filmed 100% in Montana using private financing from Montanans as well as 100% Montana actors, crew, and equipment. The film was also edited right here within the state. The wide support of other Montanan’s included free helicopter service, food, locations, film permits, costumes, city services here in Great Falls, the 2nd U.S. Cavalry out of Helena and even a Bozeman grizzly bear named Brutus. Iron Ridge is the story of two friends from the city, Jake Munro and William Price, who go deep into the backcountry of Montana for a once in a lifetime hunting trip. Once arriving, they find themselves right in the middle of one of the worlds most rugged environments. When one of the young men finds himself lost in the mountain terrain of the Big Sky country unprepared and unequipped, he will have only his instinctive skills and the dedication of a determined retired forest ranger to save his life. With a bad winter storm rolling in and the search being called off, it is just a matter of time before the lost hunter realizes that his chances of survival are hopeless, especially when he learns that a grizzly is tracking him. Now, with life-threatening injuries he will attempt to do the unthinkable, even if it costs him his life. The film stars Stu Brumbaugh, Jason Seibel, Jadi Stuart, Brutus the Bear, Huck McGowan, Casey Anderson and Colt Walke. 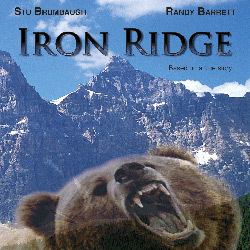 Iron Ridge was written by Great Falls native and former ski instructor Stu Brumbaugh. Brumbaugh also directed Iron Ridge and starred in it as William Price. He was also the executive producer for the film and the electrician. Stu is the president and founder of Yellow Wood Films; a production company he has been building over the past years with his own financing. 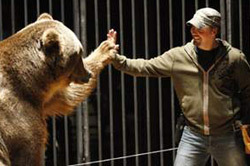 This was Brutus the Bear, a 1000 lb grizzly's first feature film. Iron Ridge was shot in Great Falls, Monarch, White Sulphur Springs, Glacier National Park, Bozeman, Paradise Valley, Choteau and Deerlodge. The film took over 2 years to complete. Brutus the Bear gets rewarded with whipped cream sprayed directly into his mouth.